Our West Sussex lamb roast becomes very lean yet, from the constant basting remains moist and melts in the mouth! We have over 25 years experience in our field. We specialise in cooking whole organic lamb traditionally beside a log fire to give a very unique flavour. Our West Sussex lamb roast is slow cooked and continuously basted for at least five hours giving a mouth-watering aroma and a taste to die for. Our “About Us” page will give you all the information on our history. All our events are bespoke to our customers and you can find out more information on “Our Service” page. We were delighted to receive a 5 star rating from the Food Standards Agency. See our hygiene certifications from our local authority food on our “Our Credentials” page. 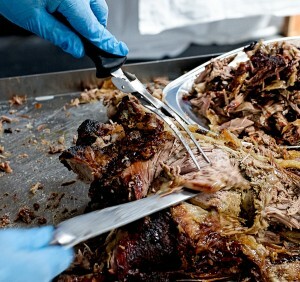 Very often Lamb spit roast still gets overlooked by people searching for the old trend of Hog Roast hire. In our experience, West Sussex lamb roast is a tastier alternative to Hog Roast in which your wedding guests, family, friends or work colleagues will adore. If your currently wedding planning, please ensure you check our wedding directories and wedding inspirations pages. We work with only the best professional partners, they are all market leading specialists. Plus read past client reviews on our “Clients Reviews” page. 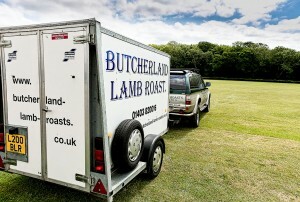 If you then require more information or would like to make a booking with us, please contact us on our office telephone number: 01403 820016 or Email us: info@butcherland-lamb-roasts.co.uk. For additional contact information, please see our “Contact Us” page. Here you’ll find our social media connections – Twitter and Facebook pages. You can also look at our photos in our “Gallery” page. Find “Links” to our friends and recommended business associates.